Even after the direct measurement of their gravitational waves, there are still mysteries surrounding black holes. What happens when two black holes merge, or when stars collide with a black hole? This has now been simulated by researchers from Goethe University Frankfurt and the Frankfurt Institute for Advanced Studies (FIAS) using a novel numerical method. The simulation code "ExaHyPE" is designed in such a way that it will be able to calculate gravitational waves on the future generation of “exascale” supercomputers. The challenge in simulating black holes lies in the necessity of solving the complex Einstein system of equations. This can only be done numerically and exploiting the power oi parallel supercomputers. How accurately and how quickly a solution can be approximated depends on the algorithm used. In this case, the team headed by Professor Luciano Rezzolla from the Institute of Theoretical Physics at the Goethe University and the FIAS achieved a milestone. Over the long term, this theoretical work could expand the experimental possibilities for detecting gravitational waves from other astronomical bodies besides black holes. 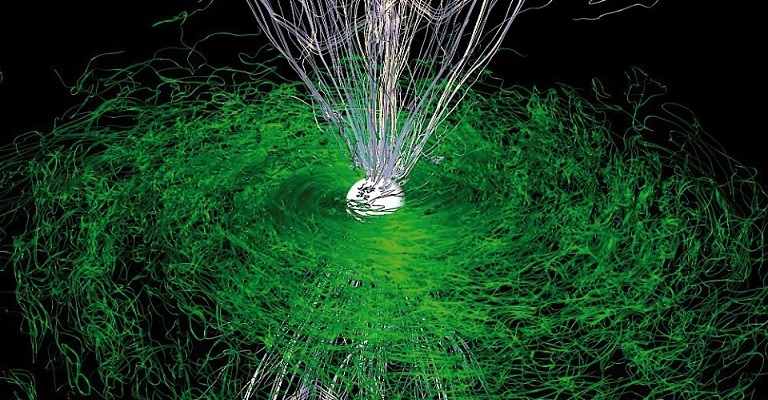 Rezollas team is part of a Europe-wide collaboration with the objective of developing a numerical simulation code for gravitational waves, "ExaHyPE", that can exploit the power of “exascale” supercomputers. While they have not yet been built, scientists around the world are already studying how to make use of exascale machines. These supercomputers represent the future evolution of today's "petascale" supercomputers, and are expected to be able to perform as many arithmetic operations per second as there are insects on Earth. This is a number with 18 zeros and it is assumed that such supercomputers will be comparable to the capacity of the human brain. While they are waiting for the first “exascale” computers to be built, the ExaHyPE scientists are already testing their software at the largest supercomputing centers available in Germany. The biggest ones are those at the Leibniz supercomputing center LRZ in Munich, and the high-performance computing center HLRS in Stuttgart. These computers are already constructed with more than 100,000 processors and will become much larger soon. Because of the analogies in the underlying equations, the new mathematical algorithms allow the investigation of tsunamis and earthquakes in addition to astrophysical compact objects such as black holes and neutron stars. Developing the new computer algorithms, which will be able to mathematically describe solids, liquids and gases within the theories of electromagnetism and gravitation, is the goal of the research project funded by the European Commission through the European Union's Horizon 2020 Research and Innovation Programme. The Frankfurt-based scientists work closely together with colleagues from Munich (Germany), Trento (Italy) and Durham (Great Britain).